Some of you know that I referee high school soccer here in Kansas. Banished from my home today for my niece’s wedding shower (thanks Ashley!) I went over to my nephew’s house and watched the US Women’s soccer team play Canada in a friendly. Initially Solo pinned the ball in front of the line, then gathered it to herself on the line, then took a Canadian kick or two which seemed to cause the bobble pictured above. In soccer, a ball on the line is still in the field of play. To be across the end-line, the entirety of the ball has to cross the line. The line itself is not supposed to be more than 5 inches wide. FIFA lists no minimum size, but I’ve seen lines less than five inches wide many times. FIFA shows in some of its rule drawings that goal posts are supposed to have the same depth as the line they sit on, so that the front of the post is on the front of the line, and the back is on the back. But there is no specific written rule that requires this. I’ve refereed many FIFA rule games with goal posts smaller than the lines they sit upon. High school rules stipulate that the back of the goal post is supposed to be aligned with the back of the end line. That way, on plays like these, the post helps the assistant referee know that the ball did not cross the line. With things set properly, if any part of the ball is touching the post, no goal has been scored. If there is a gap visible between the ball and the post to a properly positioned assistant referee, we have a goal. But if the goal post is placed differently – say the front of a 3 inch post is placed on the front of a 5 inch line – then a 1/2 inch gap between ball and post would not be a goal. We’d lose the advantage of the post serving as a vertical extension of the end line. And if the goal placement were entirely wrong – say the front of the goal is behind the line – then the picture above would be a goal, but an assistant referee accustomed to proper placement would not know that. That’s why high school referees check the placement of goal posts before games. The twitter account for CoachAD.com sent me a link to a study yesterday, and I decided to write a post about something that’s been on my mind for a while. Here’s a link to the study http://www.springerlink.com/content/r1w055654612u47j/. From there you can download the PDF or view the HTML version. I used to play youth football as an undersized fullback. I wasn’t a great player, but I did love to block. I wonder if I’d love to block today? Blocking is far different than it was in the 1970’s. On every play today there is some form of what back then would have been holding. I certainly wouldn’t mind being able to use my hands a little more as a blocker. But to me the biggest change has been that skill position blockers really can’t block below the waist. I remember spending a lot of time learning how and when to throw ‘cross-body’ blocks. The benefit for me as a 75 pound 6th grader was that I could be successful against a much bigger defensive player simply by blocking low. In that game we ran a power play off tackle out of Wishbone. Our lead halfback Kyle, officially listed at a stalwart 65 pounds, found himself directly in the path of that linebacker crashing through the C gap. Kyle has played for a couple of years and he’s a pretty courageous kid in spite of his size. He turned back inside and met that linebacker head-on, facemask squarely to the numbers. Of course, their linebacker was full-speed, and Kyle had stopped all his own momentum to meet the rush. As you might imagine, Kyle was drilled backward by the impact and flew several yards before landing in a heap. Nevertheless, his block sprung our ball-carrier for a touchdown, so it was a great block in that respect. But Kyle was carried off the field by EMT’s on a backboard – they’re appropriately cautious in our league – and rather fortunately was diagnosed with a concussion. It could have been worse. As an option coach I would love to be able to tell my guys to block below the waist out on the perimeter. Watch Georgia Tech or Navy cut, cut, cut all day long out there – sure looks easier than what we have to teach. But in our league we generally follow the NFHS rules, so our skill guys stay above the waist to block. I’ve been thinking about what happened to Kyle for quite a while. I’d wondered whether or not anybody had ever studied concussions in youth football, so I was pretty excited to see that study. Specifically of course, I was hoping to try to figure out whether little guys hitting big guys high was a more risky proposition than hitting them low. Seems obvious to me, but it probably needs a study. We don’t have low blocking these days because years ago we became very concerned about knee injuries. I wonder – have we traded off fewer knee injuries (if we even have) for an increased number of concussions? The study that I linked to above really doesn’t address what the players were doing when they received the higher risk impact accelerations (blocking, tackling, hitting the ground, etc.) but it does raise two really interesting points. My own comments on the results are beneath in italics. The study showed that head impacts increase with the level of play. 7 to 8 year-olds averaged 107 head impacts in a season. High school kids averaged 565, and college players 1000. This makes sense to me. High school and college kids practice way more than most youth football players. Figure 8-year-olds practice 4 hours per week; high school players around 10 hours; and NCAA kids are limited to 20 hours. The study showed that for youth football, higher magnitude impacts were more prevalent (76%!) in practice than in games. But in high school and college more of the heavy head impacts occurred during games. As youth football coaches, we try to create more scenarios in practice that get very young kids used to hitting. By high school and college, those are less necessary. When youth players don’t want to hit during games, they simply don’t. During practice youth coaches can be in players’ ears encouraging them to hit, despite any normal reluctance. By the time kids get to high school and college, they want to hit in games. I truly wish the study had gone further, but I have some pet theories that I will share, in the hopes of someday seeing low-blocking advantages returned to smaller football players. Physics seems to support my ideas about impacts. When two players traveling at the same velocity collide directly, more energy will be transferred to the player with smaller mass. If that energy hits the smaller player’s head, I’m guessing that is a bad thing. Less massive blockers can avoid receiving that energy by blocking low. A ‘glancing’ blow, or a collision with a smaller part (i.e. a helmet glancing off a leg instead of directly impacting a torso) would be less risky for the player with less mass. It would be analogous to ‘crumple zones’ in car crash tests. The ‘give’ in the less massive parts slow down the collision and presumably dissipate the energy. Yes, the helmet itself is in a lower spot in low blocking -but inevitably helmets are involved in effective above-the-waist blocking too. It very nearly can’t be helped. Coaches with the biggest, strongest athletes won’t care to see blocking below the waist become legal. They’d probably rather let their bigger guys run over the smaller guys. But it might level the playing field a little for the rest of us. If players on defense have to defend themselves against low blocks, will it slow down their overall horizontal pursuit speed, making final impacts safer? Knee injuries are no longer the career threatening injuries that they used to be. But concussions are very dicey things. If we could trade them off 1 for 1, in both commonality and severity, should we? In other words, is a minor concussion that keeps a player out for a week better or worse than a knee sprain that keeps a player out for a week? As a dad, I’ll take the knee sprain. In youth football, we’re not great at passing. There just aren’t a lot of great-armed 7-year-olds. Would the game improve if the odds of running the ball improved? Wouldn’t adding a viable blocking technique for smaller players improve our odds of running the ball? For that matter, wouldn’t it improve the odds of running the ball at every level? If we increase the number of running plays in a game, the clock will move faster, so there will be fewer plays overall, and naturally less risk of injury. While we would no doubt increase risks for running backs by running more, we would probably decrease risks for vulnerable quarterbacks and for receivers running patterns over the middle. A better running game means that receivers are going to be more open, and less at risk, and pass rushers will necessarily have to slow down, which will be good for quarterbacks. Everyone seems to think that tackling is lost art. If so, wouldn’t stronger rushing attack teams make us all prepare better tacklers? If we can block low out on the perimeter, we will be holding out there less often. That portion of the game will get easier for referees to call, and more fun for the blockers, because there will be fewer incidents of opposing coaches screaming for holding calls against split ends on cornerbacks. Finally, I’d be deceitful if I didn’t mention this – I think the option game would probably work a lot better in youth and high school football if we could block like the college kids! I do think the game would become more interesting and competitive if we allowed low blocking, and possibly safer, at least for smaller players. I’ve described running the Outside Veer on this site against a goal line defense, and against a ‘double eagle’ 5-3, with defensive tackles over the guards. But the play can be run against even fronts as well. For a ‘regular’ defense, the pitch key is #1, and the dive key is #2. There are three key blocks to teach. The playside offensive tackle’s goal is to block down on the #4 defender (red triangle above.) Our blocker’s first step is outside. If that defensive tackle is very athletic, or lines up in a 4 or 5 tech in order to burst outside, the block changes to a high pressure block. The offensive tackle must stay with the man until the whistle blows, pushing him further outside if he wins that gap. Normally our playside A back takes an outside path to the #3 defender. But in some defenses (as above) that man is protected by the defensive tackle. When that happens the playside A back reads the helmets of the #4 defender and the playside offensive tackle. If the defender’s helmet is inside or aligned evenly with the offensive tackle, the path to the #3 defender is outside. But if the defensive tackle jumps outside, the A back curls inside our blocker to attack the #3 defender. The split end targets #3 for a crack block. If he disappears (i.e. blitzes, or crashes for the dive) then our split end reroutes to the safety. Elsewhere, the playside guard base blocks a man-on defender, or combo blocks the inside gap. The center and backside guard scoop, and the backside tackle gets to the second level. We call the Outside Veer when the #4 defender is consistently going to the B gap. So chances are our tackle is going to be able to make his down block and our A back’s path will be outside. But it pays to be prepared. Our quarterback’s goal is to point the ball at the #2 defender and get down the line. If #2 plays slow or soft, we give. But if the #2 is suddenly invisible due to the #4, our QB can pull and cut inside, following the A back on what becomes a lead or follow play. Playing an option team soon? Need to stop them? It can be a challenge. Let me debunk one myth first. Please don’t imagine that you just have to be ‘assignment-sound.’ That’s a silly over-simplification. But most media commentators are clueless about how to really defend the option, so they trot out that old saw, and pretend that they have some insight about how to stop the play. I’m not much of a defensive guy, but hey Mr. Defensive Coordinator, aren’t you ALWAYS trying to get your guys to do their jobs, and be ‘assignment-sound’? When DON’T you play assignment football? Because I want to run whatever offense it is where you just tell your defensive guys to do whatever the heck they want. And I will debunk another myth while I’m at it – if your defense is bigger, faster, and stronger than the option team you’re about to play, you can stop reading now, because you will probably beat them anyway. We played a couple of teams this year that were across the board bigger and faster than our team, and it’s really hard to get any sort of offense going. In one game our opponent had a linebacker that was the same size as our biggest lineman, and the speed of a couple of our skill guys. That makes for a pretty good defense. But if you are concerned that athletically you’re not greatly better, I’d advise four strategies that give youth option teams some trouble. First, take away your opponent’s favorite dive path. This isn’t always easy if the team you’re playing runs multiple dives – Midline hits the A gap; ISV hits B; and OSV hits the C. But even if you’re playing a team that runs all three types of dives, try to take away their BEST dive. If it were me and I had a great nose that could dominate the center and make Midline tough, I’d do that first, then shade my defensive tackles inside to try to take away ISV. I’d tell them to get after the fullback no matter what. At that point I may be susceptible to OSV or Zone Dive, but I’d rather have their fullback running at an oblique angle than hitting straight ahead anyway. Second, play with one or fewer safeties AND put your two best football players as #3 players, one on each side of the field. I don’t care what typical defense you run, really. If you have two great football players in what we call the #3 spot (see our description of Counting Defenders to determine what the #3 spot is for your defense) then running the option becomes far more difficult. This is somewhat counterintuitive. You might expect that the pitch key (often #2 or sometimes #1) or the dive key (often #4) would be the place for your best player. But a good option team is good at reading the option. They aren’t necessarily a better blocking team. Why have your best player committing to the wrong man, or grasping at air? Shouldn’t they be fighting and beating a blocker at the point of attack? The #3 man can involve himself with ANY of the three ball carriers, except possibly a midline diving fullback, and can make plays in the B gap, C gap, and outside. Yes, an option team can create blocking schemes that cause #3 to be the pitch read, or I suppose, even the dive read on an outside veer (we don’t teach that.) But far more often the pitch key is #2 or #1, and we have to block #3. When our ISV option isn’t working, the first thing I ask is whether or not #3 is making plays. See my post Block the Fulcrum to run the triple. A good player at that position can cause so much trouble that many of our schemes call for a double-team that player, both inside and out. Third, play with very soft defenders at the #2 position, and very aggressive defenders in the #3 spot. When you invert those two personalities, you’ve made the blocking scheme much more difficult on the perimeter, and you force the quarterback to keep the ball more often than not. A QB that keeps is a QB that’s going to get hit, and youth teams seldom have two great option quarterbacks. Fourth, and most importantly – play three of or four defensive strategies within your base defense. This is probably my favorite way to defend an option attack. If you have only one defensive scheme, especially out on the perimeter, eventually even a novice option coach will come up with a scheme or adjustment to counter that defense, and they will march down the field. Or worse, they will fly down the field on one huge play. But if you can keep them guessing, they won’t be able to settle on a blocking scheme that works consistently. You know that out on the perimeter the quarterback and trail back will be running a pitch read against one of your outside defenders. If in your normal defense you’ve assigned your defensive end to the pitch back and your safety to the quarterback, change it up every three plays or so by exchanging the responsibilities of the end and safety. Or now and then roll your high safety over cover to the wide-side split end, while blitzing the corners to the C gaps. The remaining linebackers must be alert for pass receiving A backs on the short side, but most youth players have difficulty blocking a blitzing cornerback. A third adjustment might be to slide your MLB to the B gap in the motion direction, and have your tackles get outside to the quarterback. What would an offensive coordinator do if confronted with these three changing scenarios? Well, what he should do is keep running the option. But I can tell you from sad experience that option coaches will inevitably become impatient and try to ‘force’ a big play by going away from the option. And if your goal as a defensive coordinator is to get them out of the option, mission accomplished. On consecutive plays Saturday we lost our most dynamic running back to an inadvertent helmet to helmet collision, and then our starting quarterback to a minor (we hope) calf injury. So our backup guys finished off the game and our opponent with a 32 yard touchdown drive. I’m very comfortable with our depth on offense this season. It’s a little tougher on defense for us to lose two starters, but on offense, we’ve managed very well. That might be counter-intuitive for those of you that believe an option offense can only work so long as your option QB is healthy. I haven’t really found that to be the case. Our backup is 2nd string not because he can’t run the offense, but rather because he isn’t quite the same sort of athlete as our starter. It’s just a yards per carry difference. When we run the option, we’re looking for yardage that helps us make first downs, and our backups on offense are perfectly capable of running the offense efficiently. When our starting QB went out, we were facing 2nd and 8 from our opponent’s 32 yard line. The series and outcomes are outlined below, with my notes italicized. 2nd & 8, +32: Midline Right. QB misread, followed FB, and cut back for three yards. Not a bad play, just a misread. There’s a difference between a misread and a mistake. When you’re 11 years old, we don’t worry too much about a misread. If our QB misses a dive give, he’s taught to follow the FB. He did as he was taught, and he made three tough yards for us. 3rd & 5, +29: Rocket 38. QB good power turn & pitch to our 3 back running right, outran the end and turned the corner for thirteen yards. Big play on the drive. The biggest key to rocket is to hit that running back in stride. Our backup QB made a perfect pitch. 1st & 10, +16: Midline Left. Give read for seven yards. Right back to the same type of play as his first one, to see if our backup QB would read it right this time. He did, and we took seven yards right up the gut. That demoralizes the defense. 2nd & 3, +9: Midline Left. Pull read, keep for three yards for first down. Called it again to try to get the dive read to come inside. He did, and we read it correctly, but their defensive end was very tall and got one long arm on our QB as he went past. Still a positive play for a first down. 1st & Goal, +6: Option Left 17 Option. Unexpected give, touchdown. Crazy play. See the video and a detailed explanation below. Extra Point, +3: Rocket 27. Short pitch, try good. Nearly as crazy as the touchdown play. Pitch left wasn’t out as far as it needed to be, but a big hole opened up straight in front of our back, and he walked in. The touchdown play was a ‘force it’ call on my part. When I call Option Left, that’s our Inside Veer version of a true triple option. When I add “17 Option” to the tail end of that play call, I’m trying to force a fake on the dive, and leave it to the 1 back (QB) whether to keep or pitch to the trail back headed around the 7 hole. It’s basically a forced double option outside that’s run the same as the triple for everybody except the quarterback and fullback. Instead of covering both A and B gaps, the dive read, the nose, and the backside tackle all slanted toward motion. (Maybe thinking midline?) That might have been OK for them, if the MLB had covered the playside B gap – but he didn’t, or couldn’t, since our tackle got out to him. Normally T4 lining up in a 3 tech or 2 tech (as above) calls for an automatic pull. Our young quarterbacks are taught that if the dive key is inside our tackle, pull the ball. Further, if I tag an option play call with 17 or 18, I’m saying to pull the ball and run outside option. Those were two very good reasons not to give the ball. Yet the dive was given, and we scored a touchdown. Teaching the option to young players has been an adventure. Often they don’t do it just the way you’d drawn it up or called it. I still don’t know why our lead A back jumped in front of the #2 man on that play. He doesn’t know either, but it helped the play. I think this offense has created some fast-reacting brains. Different and unexpected things always happen on the field, presenting unpredictable problems as well as opportunities, and our kids aren’t phased. They play with confidence, and look to exploit those opportunities. The opposing coach, by slanting inside away from motion, and bringing his OLB to the pitch, was taking away midline as well as the outside option. What he couldn’t account for was our kids ability to change things up on the fly, and to react to what they saw. The fullback knew just what to do when he felt the ball seat. The quarterback knew he’d handle it. They took the wide open, simple football play and scored, despite my efforts to the contrary. We were facing 4th & 1 on our opening drive. Our fullback had been pretty effective to that point, but their defensive end (#18) was giving us trouble. 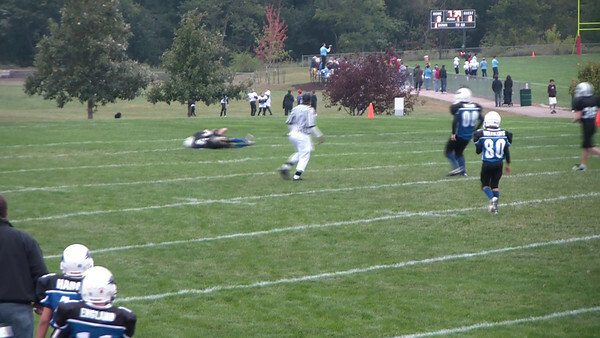 We decided to run Outside Veer and make that kid the dive read, and see if we could get a yard one way or the other. I almost called timeout when I saw they’d moved him from end to defensive tackle, right where we were trying to run. We’d talked to our offensive tackle about how to down block a guy like that, just this week – but he was just too athletic for our guy, and our fullback was in major trouble. Click the pic below to be taken to my video site for a high definition look at the play. The back story here is that our quarterback asked me two weeks ago why it seemed to him ‘easier’ to break inside on many of the Outside Veer plays, rather than to pull and pop around the dive key. I told him that what he was probably seeing were ‘wrong shoulder’ defensive ends. By that I meant that an end can crash down on our fullback on this play, but do so with his head on the wrong side, to try to hedge the quarterback from pulling and getting two on one with the cornerback. You get a great view of a wrong-shoulder defensive end on the video above. I showed him how the defensive end might play the fullback, and told him that his instincts weren’t necessarily wrong in those cases. Many times you can get some nice yardage by cutting inside the fullback on the outside veer play. I didn’t know that the conversation would bear fruit quite so quickly, but I’m really glad he asked me about it. Our playside guard doesn’t take a great angle to the MLB. He only had eyes for the fullback though, so that worked out. Our quarterback, once he breaks clean, looks like he’s pretty sure he’s going to score, and he’s a little careless with the ball. I’m on the sideline screaming ‘BALL, BALL, BALL!’ because I just know that #2, who is one of the fastest kids in the league, is going to chop the ball out. He didn’t, and we were a little lucky. I have two parts of the play that I love, in addition to the great pull read and cut by our quarterback. The first is the reaction of the opposing coaches when they stone our fullback. That was pretty fun to watch on video. The other is our backside guard (#3), who blocks THREE GUYS on that play. If every kid worked that hard on every play, youth football would be a lot easier. I added Rocket this year. I’d messed around with a ‘quick pitch’ when we were a wishbone team just starting out, and had a power sweep for our entire time, and still do. But I was speaking with another youth option coach a couple of weeks ago, and he convinced me that Rocket was a missing component. Here’s a quick look at how it worked for us opening weekend. Note that the 3 tech isn’t even blocked. Since the nose had put himself in the gap, our guard made a choice to protect our quarterback, not certain the center could get there if the defender shot the gap. No complaints. I was able to freeze the playback to see the pitch – our A back catches the pitch dead even with the defensive end. That’s a pretty good pitch for sixth grade I think. Our playside tackle gets a finger on the OLB. Our split end whiffed when the CB came inside too hard and spun back to the outside – but that was fine. Our playside A back got a little interference with the DE, then went out to the OLB himself. We’d have scored from anywhere on the field I think.